Otherwise known as a 1980 Mint Set, or as the US Mint termed it on the front of their brochure – the 1980 Unc’s. Today, we’re taking a step, several of them, back in time to look at the US Mint’s brochure for the 1980 Uncirculated Mint Sets. This brochure was found in a collection. They had it tucked away with their order of 1980 Mint Sets. 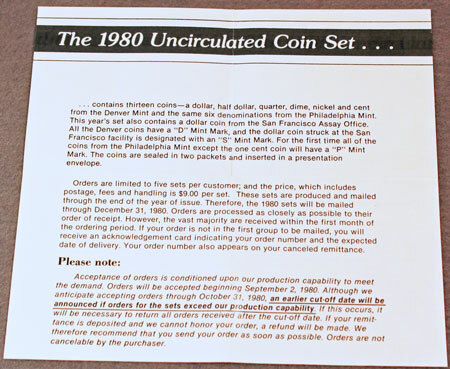 Considering this was 1980 before computers and the internet became readily available and affordable to the masses, people placed orders with the US Mint via the US Mail. Since this collector did make an order, the actual order form was not found with the brochure. And, though the number should no longer be active, the customer’s number has been blocked on the slightest, remotest chance that some nefarious person could identify them for less than honest purposes. … contains thirteen coins – a dollar, half dollar, quarter, dime, nickel and cent from the Denver Mint and the same six denominations from the Philadelphia Mint. This year’s set also contains a dollar coin from the San Francisco Assay Office. All the Denver coins have a “D” Mint Mark, and the dollar coin struck at the San Francisco facility is designated with an “S” Mint Mark. For the first time all of the coins from the Philadelphia Mint except for the one cent coin will have a “P” Mint Mark. The coins are sealed in two packets and inserted in a presentation envelope. Orders are limited to five sets per customer; and the price, which includes postage, fees and handling is $9.00 per set. These sets are produced and mailed through the end of the year of issue. Therefore, the 1980 sets will be mailed through December 31, 1980. Orders are processed as closely as possible to their order of receipt. However, the vast majority are received within the first month of the ordering period. If your order is not in the first group to be mailed, you will receive an acknowledgement card indicating your order number and the expected date of delivery. Your order number also appears on your canceled remittance. Acceptance of orders is conditioned upon our production capability to meet the demand. Orders will be accepted beginning September 2, 1980. Although we anticipate accepting orders through October 31, 1980, an earlier cut-off date will be announced if orders for the sets exceed our production capability. If this occurs, it will be necessary to return all orders received after the cut-off date. If your remittance is deposited and we cannot honor your order, a refund will be made. We therefore recommend that you send your order as soon as possible. Orders are not cancelable by the purchaser. Read through those cautions and rules again. They did some subtle arm-twisting to get people to order quickly – note the section bolded by the US Mint and underlined by the customer. That last sentence, though, is interesting. Looking at these old US Mint brochures makes one thankful for the newer technology. Sure, technology can be just as ornery as it is beneficial, but look at how much easier it is today to place orders with the US Mint online – not always perfect, but easier than in 1980. Head on over to our main web site to see a 1980 Mint Set. While there, take a look at Days of Our Coins.